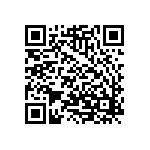 In my 11 months here at Droid Life, it’s become apparent that most of our community use one of two different home replacement tools: LauncherPro or ADW Launcher. It’s gotten to the point that these tools are deemed essential to Android users because of the additions they bring to an otherwise boring Android home screen. That one row of buttons adds a lot of functionality and saves a lot of space; something that’s precious on a stock 4×4 grid. Naturally, when a new home replacement comes along, it’s easy to dismiss it. How could it even come close to the “big two?” However, I urge you to read on: GO Launcher is no half-assed effort. I was originally going to write this article about GO Launcher, which comes to us from the aptly-named GO Development team. 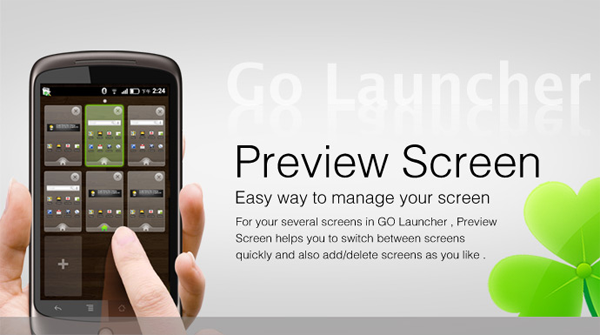 However, in the time it took to plan things, a new version of the launcher came out, titled GO Launcher EX. The EX version comes with some performance upgrades, theme support and some changes to how the app was structured: I’ll be taking a look at each in my review. From the get-go, GO Launcher seems similar to LauncherPro and ADW; it adds the familiar dock to the bottom of your Android home screen that is both customizable and scrollable. You can have up to 3 rows of docks, which you move through by gesture-flicking left or right. I’ve turned this off, as I prefer a dock that stays constant. 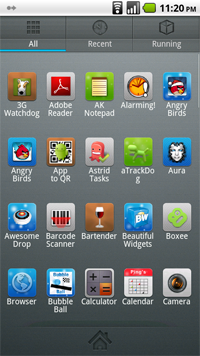 Each dock icon can be customized with themed icons, or default ones. Furthermore, each button can be assigned a gesture command, as well. This is activated by swiping in any direction with your finger starting on the button. It’s a bit unintuitive at first, but it works. I can’t imagine it working in a moving situation, though, as sometimes my hands aren’t the most steady things in the world. Also developed by the team is a separate app for notifying users of how many missed calls/texts/Gmail they’ve missed, right in the dock. The reason for the separation is that some people didn’t appreciate an app that looked into their call/text history. This function works fine, but sadly it doesn’t seem to co-operate with Handcent SMS; it works with the stock messaging app just fine. However, when you open the app drawer, something is glaringly different; the background is solid, the waterfall animations of other launchers is not present, and there are two new tabs along the top: “Recent” and “Running”. These two tabs do exactly what you’d think: they list apps you’ve recently opened, and apps that are running, respectively. The latter acts as a task killer/applications manager hybrid. Clicking on apps in this screen opens a pop-up asking you to choose “Close”, “Lock”, “Goto” or “Info”; while the first two’s functions are evident (killing the task or keeping it from closing, respectively), the latter two are interesting additions. 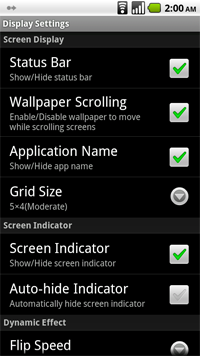 “Goto” opens the app, while “Info” opens its page in your phone’s Settings > Applications menu. 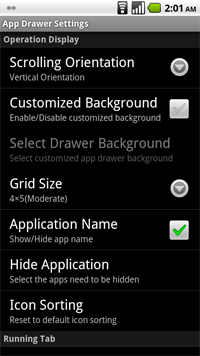 I find this extremely useful for when I want to move apps from my SD card and back, or just want to check up on things. This functionality is on top of the ability to long-press on apps in the normal app drawer and uninstall them directly from there. After some haptic feedback, little red “X” hovers over every uninstallable app, and clicking on it once takes you directly to the uninstall page. As someone who used “Quick Uninstall” before it merged with Atrackdog, I cannot love this enough. Simple and no-frills. Apps can be sorted by name or installation date – newest first or last. This is a nice feature, but between sortings it defaults back to “newest last”; every time I install a new app, I need to re-sort. Upgliding on any home screen brings you into a robust editing mode: you can customize order and number of home screens simply by dragging and dropping, or clicking on buttons. It also shows a live preview of screens, so when you’re thinking about order, you don’t need to keep a note of which is which. 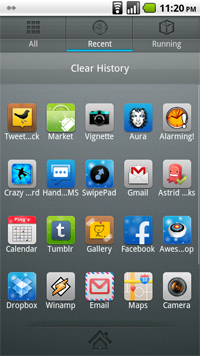 Apps are brought from drawer to home screen by long-pressing on an icon and then dragging into a “move to screen” area at the bottom. After that, you can drag it to one of the screen previews from before, so you know where it’ll fit in. However, this brings me to my one problem with GO Launcher. When your screens are full, that app will not drop. This makes sense, except when there’s a folder I want to throw my app in. Because trying to move an app from screen to screen brings up that darned preview window, I can’t even throw it on an empty home spot somewhere else and then drag it sideways. Instead, I must make sure that there’s a blank spot to drag icons from the drawer to, then from there, I can put it in the folder I want. You would be surprised how quickly this gets annoying. 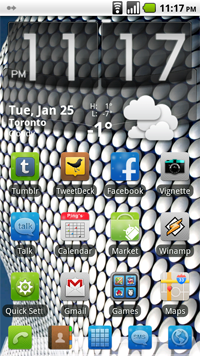 The phone sports a nice themeing system, which actually got me to use themes on my launcher. 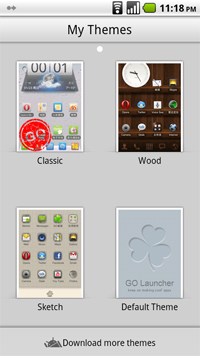 Each theme (installed separately through the market) comes with a wallpaper, icon and dock set. Some, like the “original” theme I’m using in my screenshots, alter app icons significantly, while the “default” theme leaves them alone. I’m going to dock some points from GO because I’d prefer they use the Beautiful Widgets “in-app” system of downloading skins instead of the market method: this tends to clutter search results quite fast. What’s important is that the theming is not difficult to use and that it doesn’t disrupt the normal operation of the launcher. That’s GO’s strength as a whole, actually: it just works. I haven’t had it crash in the approximate month I’ve used it, nor have I had any major tech-related screw-ups. I’ve never had to kill its process to resolve a freeze, or had the screens lock up while switching back and forth. I honestly can’t say the same for when I’ve used ADW or LauncherPro. That could be a result of a number of different factors: I’ve used LauncherPro, Helix and ADW on different combinations of unrooted and rooted, along with updated ROMs. Any of those things could have triggered my problems. However, what I know now is that minus that one annoying issue with the folders, GO’s earned its spot on my phone. Matt Demers is a Toronto writer who doesn’t understand why everyone needs like 10 home screens; he’s whittled his down to one. If you’ve liked what you’ve read, follow him on Twitter. Tuesday Poll: Does 3D Technology in Smartphones Interest You? DROID X2 Running Under Codename "Daytona"?